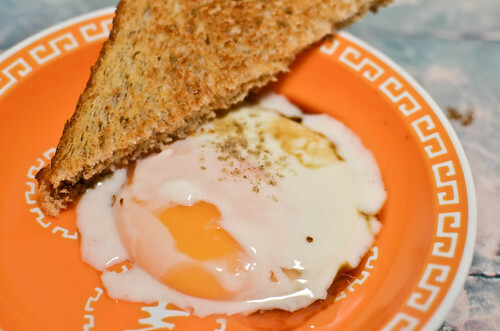 1) Soft-boiled Egg – This breakfast item is an all-time favorite of mine that was nearly wiped off the face of my memory bank. I was mildly surprised to be presented this egg dish one morning while staying at my auntie’s place. This delicately prepared and equally delicate tasting dish speaks of pure simplicity in the ingredient: a fresh golden-yolk egg that is barely cooked. With a couple of drops of soy sauce and a dash of white pepper, it makes the perfect “sauce” to dunk a piece of toast – the perfect morning bliss for me and for my mother who also shares her love for this. 2) Roast Duck – Walking around various neighborhoods in Kuala Lumpur, Malaysia, you will notice coffee shops everywhere that cater to the culinary needs of the residents in the vicinity and even to those from other neighborhoods, depending on the reputation of the food. 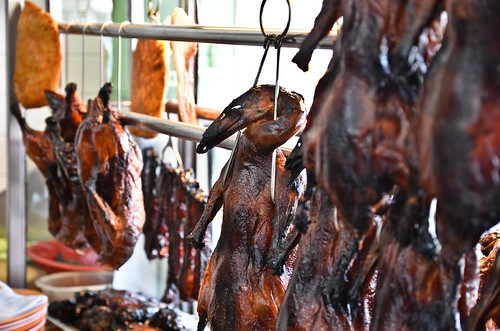 One such place was this eatery that served roast meats and its renowned Roast Duck. What made this rendition superb was the complete rendering of the fat from the skin, which made it palatable, and the light seasoning of the flesh that had hints of 5 spice powder. The accompanying sauces augmented the various flavors and spices found in the meat itself. It was a good thing we got there just as the shop opened just before the huge crowd it tends to attract. 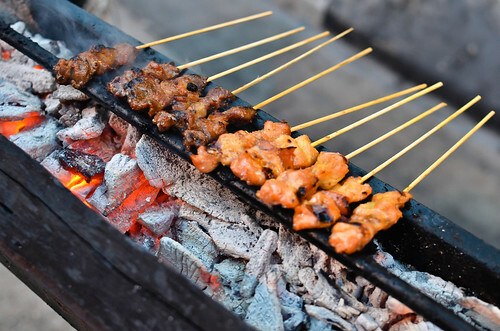 3) Satay – On my way to meet up with an old college buddy in Kuala Lumpur, I came across a Satay vendor who was cooking these sticks of meat the traditional way, over some coals outdoors. Although I had a serving of this in Sydney, I was rather disappointed by its lack of charcoal char and the rather weak peanut sauce. But passing by this sight reminded me of the real flavors of this Malay favorite among Malaysians and others. If weren’t for dinner plans, I would have taken a seat and placed an order of this sumptuous looking sight. 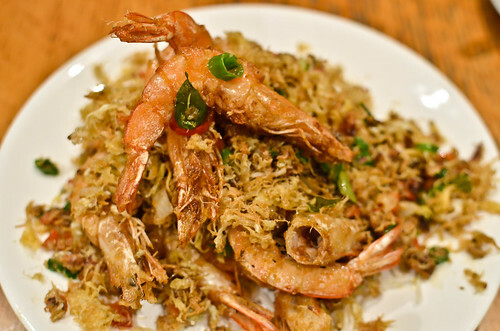 4) Butter Prawns – This is truly a Malaysian seafood classic. Unpeeled Prawns are deep-fried until the shell is completely edible. A topping consisting of whispy bits of egg white fried in butter (hence its name) provides a rich flavor along with its crispy texture. Slices of chili and curry leaves add the fragrant and spice elements to this dish that takes the dish to another level. This is a must-order from a good seafood restaurant when in Malaysia, or a Malaysian restaurant anywhere else, like what I had in Melbourne, Australia. 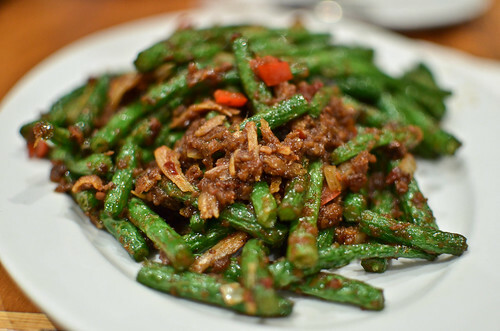 5) Sambal Kacang Panjang/Spiced Longbeans – Longbeans are a favorite among most Asians for its versatility and taste. Here it is cooked the Malay way with a spice paste consisting of shallots, dried shrimp and dried chilies. This condiment adds the spice heat and flavor elements to the rather bland vegetable that can hold up to some serious wok searing. The addition of fried dried whitebait fish (Ikan Bilis) brings a contrasting textural element to the softer vegetables as well as additional flavor to this already flavor-packed dish. Love my veggies cooked this way. 6) Char Tau Kueh – This Hokkien breakfast item cannot be classified as a noodle or rice dish although the main starch is made from rice flour that have been mixed with water and steamed until it has firmed up. 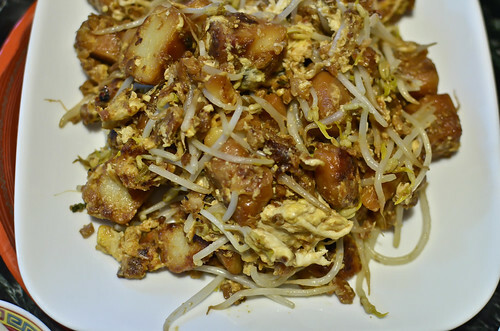 It is then cut into square pieces and wok seared with garlic, egg, beansprouts, and dried pickled vegetables. The bits of rice cake are rather bland but the addition of soy sauce and the pickles add the necessary flavorings to this dish. This is one of my favorite breakfast dishes my mum would buy from the local morning market, and I glad I savored it a couple of times on this trip. Fresh Tofu Salad – Malaysians have a penchant for tofu, especially in the fresh form. Staying at my auntie’s place in Kuala Lumpur, I was presented this cold dish for dinner which was served in my parents home weekly especially on our meatless Fridays. 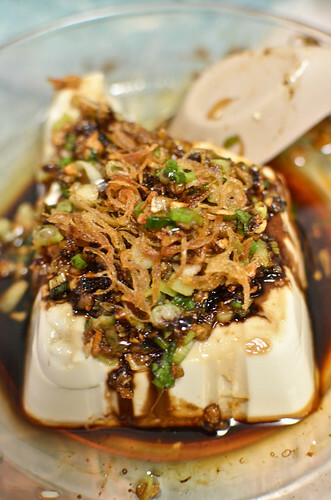 It is soft fresh tofu that is topped with oyster and dark soy sauces, aromatic crispy fried shallot rings and topped with some green onions, and/or coriander leaves like how I prepare it. This is truly a refreshing vegan dish and a true study of flavor and textural contrast. 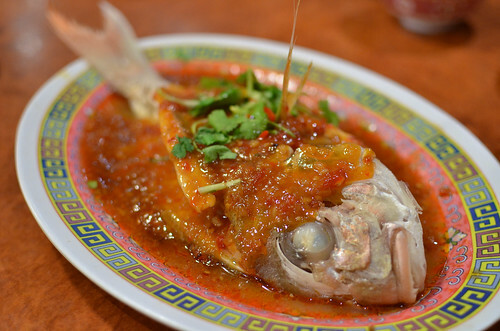 8) Assam Fish – this dish was already featured in the previous blog, but I wanted to show that in Malaysia, it is common to serve the fish whole with the head and eyeballs intact. Most Asians are suspicious of restaurants that do not serve the fish in its entirety thus this common practice. For most Westerners, this can be rather off-putting with the huge eyeballs staring at you especially when the head is pointing towards such eater at the dinner table. 9) Tofu Mixed Vegetables – For most Malaysians, a meal would be incomplete if a dish made with fresh vegetables is not ordered. One of my favorite way of having the greens cooked is with a light sauce and with some fried tofu bits. The frying of the tofu firms up the soy cakes and provides a rougher texture on the outside. 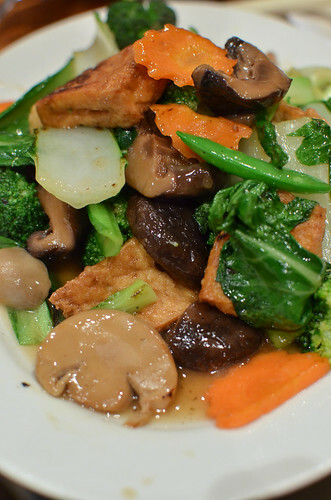 The addition of Chinese mushroom adds a depth in flavor to the sauce and a “meaty texture” to the quickly cooked and crunchy vegetable pieces. This is Vegan Heaven here. 10) Hor Chien/Oyster Pancake – When I was visiting my parents in Melbourne, we stopped at one of the many Malaysian eateries that dot their residential area – yes, they are never lacking in this culinary department. One of the specials for that day was a dish that I had not eaten for many years – Hor Chien. It is basically fresh small oysters that are fried in an egg/flour batter until the outside is slightly crispy and the interior still quite soft. 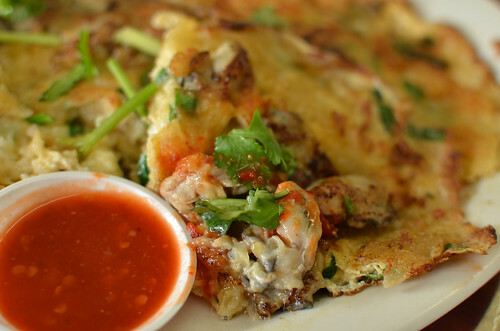 The obligatory sour chili sauce provides the necessary foil to cut through the richness of this seafood pancake. This brings back memories of eating this during my childhood at seafood restaurants when my father used to take us back to his hometown in Melaka. 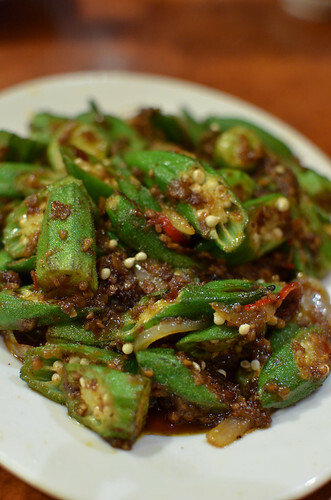 11) Sambal Bendi/Okra – Here, we have Okra, or Lady’s Finger as it is known in Malaysia, which in this case, has been cooked the same way as the above Longbean dish, with a chili spice paste that adds tremendous flavors to this mild vegetable. The secret to cooking this dish is to wok sear it very quickly so that the high heat cooks the okra bits while maintaining a slight crunch at the end. As a child, I would pick these “lady’s fingers” growing in the backyard for this dish. This is definitely not the slimy version that most Americans are used to and have an aversion for. As you can see from this blog and the previous one, Malaysian Breakfast, Lunch, and Dinner1, the food is a reflection of the bounty in a tropical climate: the abundance of seafood in its surrounding waters, the meat and poultry that are never lacking of feed around them, vegetables, herb and spices that grow without much effort that add the necessary fiery and flavorful complexity to the delicious dishes. 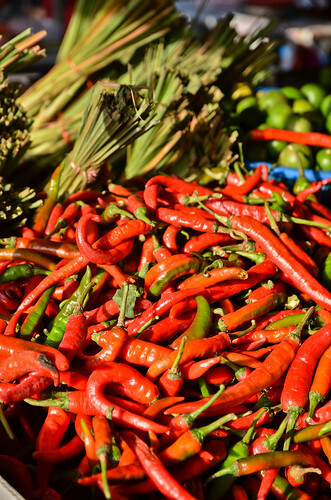 With the influences of various culinary traditions arriving together at this intersection, the result is fresh food that is cooked in an unlimited number of ways that produce an amazing array of temptations. Resistance is just futile around this part of the world.